Via Skeptico and one of his readers I became familiar with a new scare. Now, I know that some people think that they are electrosensitive, others think that cell phone use leads to cancer. This question was asking about s specific wireless technology called DECT and whether or not it could be dangerous. He got turned on to this worry due to a number of articles about it. Like this one and this one. One thing to point out.. every single article I can post eventually points back to this single article on the subject. Shall we raise the nonsense flag now? No, I think we can delve into it a bit. Before we start, I think we should go over radiation and radiowaves. There is so much equivocation out there about various terms its no wonder people get freaked out. Radiation: When we talk about radiation we are talking about the projection of energy from a source, which travels through some sort of medium (it could be air, or vacuum, or camel poo) which eventually get absorbed or reflected by some other object (which is usually referred to as a body, initiating even more equivocation, it doesn't mean human body). This energy could be in the form of sound waves, water ripples on a pond, light, gamma rays. These are all radiation. Clearly we do not have to worry about most of this radiation. We do not worry about standing in front of car headlights, or putting in a 100 watt bulb. The main radiation we worry about is ionizing radiation. This is the nasty stuff because it can lift electrons off of molecules and change chemical structures. We don't like this kind. But even this kind is probably less scary than you think. Is plutonium a scary substance to you? Well it can certainly be used as fissile material, and the Pu238 form of it emits radiation certainly. Lots of it, but it is alpha radiation which cant even penetrate your skin. Its the Pu239 isotope that is more worrisome as that is the one used as fissile material and emits gamma rays. So even in the world of ionizing radiation, not everything is the bad stuff. Most of the radiation we worry about are high energy radiation like X-rays and Gamma Rays which are ionizing. we don't really worry too much about non-ionizing radiation like visible light, infrared or radio waves like you get over your FM radio or TV. These forms of radiation are generally absorbed (like how a black surface will absorb visible light) or reflected (like how a white surface reflects visible light) or transmitted (like visible light through glass). Often when one type of light is absorbed it may get emitted as another form of radiation. For example, when sunlight hits the earth the rocks and soil absorb the visible light and then emit some of that energy as infrared light (as a side note, the mechanism for global warming is due to the fact the CO2 transmits visible light but reflects infrared light, so sunlight goes right through it, hitting the earth ,which emits heat that gets reflected back). OK, I hope this takes away some of the mystery of the scary word Radiation. If someone says radiation, the first question should be "What kind?". The same goes for sound waves, radio waves, ultraviolet waves and gamma waves. In fact, the spectrum of frequencies is well mapped out, here is a terse one. So if you look, there is a whole range of frequencies with names of things we are generally not afraid of: Visible light, infrared, radio. Smack in the middle of this list is microwaves. Microwaves: The only reason microwaves sound scary is that we have devised machines that generate them to cook food. How does this work? Well, as I mentioned before, if an object absorbs one type of radiation, it will heat up and perhaps emit some energy as another type of radiation. This is what happens to your food in a microwave. The machine emits what is essentially light, at a different frequency than what we can see, which gets absorbed by the water in the food and heats the food. It heats so much that it cooks it. To be crystal clear, this is no different than sending infrared waves to your food to cook it like your stove or oven does. It does not cook your food from the inside out, anymore than your oven can cook your food from the inside out. The cool part about a microwave oven is that many of the plates and containers that we put in there transmit microwave radiation and therefore don't heat up (however some ceramics and glasses do absorb microwaves and do heat). The reason that it heats your food is that the power of the emitter is very high and the frequency of the microwave is tuned for optimal water absorption, which happens to be about 2.45 gigahertz. The reason you don't want to stick your hand in a microwave is because it will cook, not because of any effects of ionizing radiation. One more note about radiation: you are constantly exposed to it. There is ionizing radiation from space and from the ground, you get exposure from CAT scans and X-Rays at your doctors office, you get it from all around you. Only a small fraction of the radiation you are exposed to comes from consumer products, combined! There is no conclusive evidence that cell phones or power lines cause cancer. Cell phone towers don't cause suicide rates to rise. You cant pop popcorn with cell phones. Your microwave can pop popcorn, not solely due to the frequency but mostly because of the power. A microwave oven produces in the range of 700 watts of microwave power that gets converted to heat in the water inside the popcorn (popcorn pops due to the water inside of each kernel). A cell phone only puts out 1 to 3 watts, its simply not enough power to boil water of any significant amount. I think we are ready to talk about DECT radio systems. Digital Enhanced Cordless Technology is simply a standard, like NTSC for your television is a standard or like how there is an TCP/IP standard for your computer to communicate with the internet, or how there is a standard the defines the size and shape of your power outlet. The DECT standard defines the way the phone or baby monitor works. It defines the frequencies it will operate on, the way in encodes the voice data, the way it communicates with the hand set or base station, the power it will transmit at and a whole host of other things. You don't put DECT in a phone any more than you can put NTSC in a TV. The TV conforms to an NTSC standard and a DECT phone conforms to a DECT standard. Yes, it operated the the area of the electromagnetic spectrum that we colloquially call 'microwaves'. No, it is not like a microwave oven. The frequencies it uses are not tuned to heat water and further, the specification fixes the transmission power to only 10 milliwatts (remember how much an oven uses?). Even if it used the exact same frequency as a microwave oven, the power is so abysmally small it wouldn't heat up a the water that fogs your glasses when you come from a humid area into an air conditioned one! A major difference between the older cordless phone and the DECT cordless phones is that the DECT phone’s base station continuously emits pulsing microwave radiation at full power as long as the base station/charger is plugged into the 240 VAC wall socket. This means that the base station, usually placed on a bedside table, or on a work desk, is broadcasting a 2.4. or 5.8 GHz transmission (in Australia) regardless of whether the handset is charging in the base station cradle or being used 300 meters away. So what? The author is confusing frequency with power. Full power for this device, as previously mentioned is 10 milliwatts (25o milliwatts peak). Those pulses he is referring to, those are the peaks, most of the time the power is only 10 milliwatts. This is an amazingly low amount of power. The phone works well due to the way it encodes and transmits the information, not because it has a powerful signal. FM radio tower in Ouruhia, NZ in 1998, there was a significant incidence of both chronic fatigue (37%) and sleep problems (35%). This 'study' he refers to is simply not a scientific study as he implies. Its a report on the concerns of people who live near a n FM radio tower. Are you telling me that people who live near a a technology they don't understand that looks incredibly ugly are complaining? Remarkable. I'm floored. /sarcasm. In the study conducted in 1992 an increased prevalence of sleep disturbances (problems of sleeping through) in the vicinity of the transmitter were demonstrated. The short time series analysis (three times 10 days) pointed in the same direction, however, these results, due to missing one-to-one exposure measurements, were difficult to interpret. We were not able to do person oriented measurements of exposure at that time and we still couldn’t do it today because of the unwieldy measurement equipment. So basically people can't sleep in the region but they were unable to directly associate it to the transmissions. It could have been traffic congestion, local economy causing stress, the smell of manure. Maybe the power supply for the phone is buzzing. Who knows? In 1993 neither an acute nor a chronic effect on sleep quality or 6-OHMS could be demonstrated in humans. In cows no chronic effects were obtained either. I'll refrain from the sarcasm, and lastly.. In 1996 during another cross-sectional study it has been confirmed that sleep disturbances in the vicinity of the transmitter are more frequent as compared to the non-exposed control area. Furthermore, it could be shown that the exposed population applied coping measures by avoiding heavy meals and coffee consumption in the evening. There was a tendency for higher uptake of sleeping pills within the exposed area. There are no conclusions after studying this for 10 years, and the author of the first article is unable to come up with any results of a study that is even a grade C.
He then goes into a litany of possible things DECT can cause. For this I refer you to the wackos that have the exact same list for Nutrasweet, milk, flouride, the mercury militia, and other unsupported causes of everything bad. ooh some are calling it Microwave illness. Basically study after study after study shows that although people think that they have electromagnetic sensitivity, when actually testing in blind (grade B) conditions, they lose their ability to be sensitive to it any more. Its not that these people arent suffering, they are just trying to get relief from the wrong place. They need a therapist, not a scientist or a medical doctor. If you arent worried about your TV, or sleeping near your cell phone, or having heated sheets or leaving your computer on, then you really shouldn't worry about the effects of a DECT phone. There is simply no mechanism by which it can bother you, and better than that, there is really no evidence that the actual tiny emmissions from any radio device actually affects anyone, mechanism or not. The only I'd worry about with a phone system that bursts 2.4GHz signals periodically is that it might, just might, interfere with a local wifi setup. Though even that could probably be tuned out by playing around the channel settings. its certainly true that this can happen. I intentionally left out discussion of how spread spectrum communication works or even the wireless methods like CDMA, or TDMA. I thought it would confuse matters. But these technologies are the reason why multiple devices can talk at the same frequency. Its how your wireless router has 'channels' even though it only uses one frequency. A microwave blasts out energy at many frequencies around 2.5GHz which is why it can interrupt some wireless equipment. Great post! I've seen your comments on Skeptico before, but this is the first time I've seen your blog. Great stuff! In our kitchen we have our FM radio on top of the microwave. I now understand why the radio buzzes when I defrost a chicken. Unfortunately we have one of those low "emissions" babyphone (quote my spouse: to be on the safe side). Well it works, but just about 30 m maximum, which makes it ok in a flat, but totaly useless for everywhere else. Yeah well maybe you are an expert in electromagnetism and electronics and that tech stuff, but you I assure you Mister you don't fool me with the foggy glasses. My experience is probably years ahead of yours so you should listen as I speak with a voice of authority: they fog when you move from cold to humid! Here thanks to the Skeptic's circle. Will be back. "Have you tried to get a sunburn or fry your hand with a flashlight ?" Then I explain to them that a cell phone has approximately the same power than a flashlight, but its wavelenght goes through the body, unlike lightwaves. So there is even _LESS_ energy available to cause damage. In any case, they would have kept on using their cell phone anyways, so I wonder why I bother. I really do wish schools would teach people something about RF. For power, I know FCC part 15 limits power for unlicensed transmitters to 100mW, but I think different rules apply on the 2.4GHz ISM band. Oddly enough, IIRC, most of the wifi routers I've seen land around 50mW output. I came across these dangers a year ago and moved the base to the basement. I'm still not convinsed given the rebuttals in the articles below. first off, thank you for visiting. Unlike many of the normal arenas of woo, I dont think that taking action against this imaginary problem will hurt you. Unlike the potential of harm of other types of woo. So if you feel the need to put the base station in the basement, go for it. However for the fear you are worried about, your action is 100% useless. If you are putting the base station in the basement, it means that you are not using a DECT baby monitor (unless your bedroom is in the basement), it means you are using a DECT phone. If you are using a DECT phone, then all handsets and the base have two way communication. Which means DECT receivers as well as transmitters are in each handset. Which of course means that each handset is sending out the same encoding, same signal, same frequency and same strength as the base station. All the base station does is act as an air traffic controller for the different handsets. Its not the radio that allows the multiple handsets, its the encoding. What are you gaining? If you are really worried about this issue, you should be putting all the handsets and the base station in the basement. Also know this: If you "go analog" (can you still do that?) the signal strength is stronger (because encoding is not used and the only way to clear up transmission is to increase the signal strength). you best solution to alleviate your issues with DECT is to hardwire all your phones and get off of cordless phones altogether. Finally, in the post, I linked to a double blind study for people who claim they are electro-sensitive. It shows that this ability disappears when the subjects don't know if a device is powered or not. In all those fear mongering pages with multitudes of links can you find one single double blind study (grade B or better) that gives a positive result for electrosensitivity. Quantity of links doesn't make something more right, much like when I looked at the anti-DECT articles that I linked to, they eventually ended up pointing to the same single review. But i'll look through your pags. People who fear some new technology will of course have a bad psychological reaction. Just like people who embrace nonsense like say, Tong Renhave a positive psychological reaction. Only a real study can separate nonsense from reality. But thanks for the pages of links. I will likely go through those one day when I have time and post a response to them if one is necessary either in endorsement or refutation. I'm a bit confused at your choice of image. You talk about the spectrum of frequencies, then try to illustrate your point by showing the reader a map of the electromagnetic spectrum by wavelength (which your post does not mention at all). There are no Hertz or reciprocal seconds used as units, only centimetres and kilometres. Now I'm well aware of the relationship between wavelengths and frequencies, but wouldn't your point be better illustrated by a picture using units of frequency? It doesnt sound like you are confused, just perhaps being helpful. I certainly overlooked that aspect of the image, and if I get a little time, I'll fix it. Getting appropriate (free) images isn't always the easiest thing to do, but in this case, I simply let it slip. For those that forgotten, frequency=1/wavelength. So whether the graph is in frequency or wavelength doesn't change the point of the article nor its accuracy. If we talk about high frequencies, we are simply talking about short wavelengths. If we are talking about low frequencies, then we are talking about long wavelengths. The effect (or non-effect) of this terminology with respect to the post is zero. Thanks for catching that BuggBY. I think you article is a bit confusing in regard to what you're trying to do. 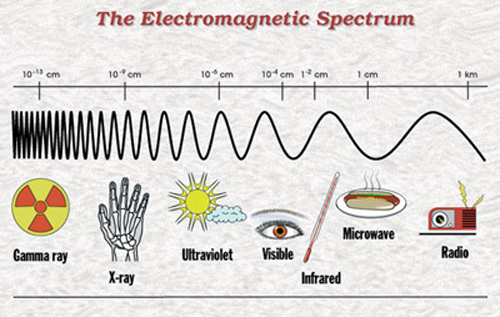 The physics lesson about the electromagnetic spectrum should be in a separate but linked to post. In particular, the ionizing radiation should definitely not be in this article. The article would be better suited if you just concentrated on explaining microwave range and how it simply passes through most objects, including walls and range is limited more by the factor of energy dispersal at a /r3 type rate than the energy being absorbed. Also the point on Digital using less power than analog and thus being safer is a good one to make. I wonder if people will suddenly become scared of the TV spectrum once the radiowaves get reassigned? I think this article is as un-scientific as the one it tries to debunk. By debunking the false allegations you don't give me an real explanation why these physical phenomena are completely harmless. Instead of concluding it's no harm, a scientific conclusion should be 'I don't know'. And from this a lot of times there can easily be concluded that it's no harm indeed. But in the meantime I'd suggest people should be vigilent about wireless, cell phone, etc; use it, but with caution. My wireless router shuts off during the night, mostly to save some power but as noone is using it, I don't see why it should be on. So unless you are 100% absolutely sure you understand everything about magnetism & radiation, any conclusion may be preliminary. Sorry. Let me see if I have this straight. You are saying that this article is "unscientific" because I failed to prove that something doesn't happen? I think that perhaps you need a refresher course on the scientific method. You are asking me to prove a negative. If I have not interpreted your comment incorrectly, then could you please return the $5000 of mine that you have, or prove to me that you do not have it. I specifically pointed out the incredibly low amplitudes involved with both cell and DECT technology,DECT providing an order of magnitude lower than even a cell phone. One reader correctly pointed out... if you are afraid of DECT or Cell phones, you should be more afraid of flashlights. Good for you, Techskeptic. I almost started to get rid of my DECT phone and my wireless router today after reading the latest study warning us of the dangers of EMFs, but your logical explanations (as well as the site by which I found you, skepdic.com), helped to calm me down. And your response to Karl was great. He reminds me of the people who say that God exists because I can't prove that he doesn't. Duh. Thanks for helping me learn more about this technology and assuage my concerns. Just a not so hands-on on phones. Surely this will help prevent risk. Techskeptic - I agree with Karl and I think you understate the impact of non-ionizing radiation. We know it can be biologically active - it is the reason you 'see' light, 'feel' infrared heat, and get burned by UV from the sun. Laser light is typically non-ionizing and certainly can cause damage. You have several flip comments which are basically incorrect. Standing in front of car headlights can be harmful. Intense blue light is damaging to the retina - newer headlamps may help the driver see, but are bad for everyone else. Microwave ovens 'do' heat from the inside, which is a different mechanism from standard ovens. They add energy to food by exciting the water molecules inside the food, which is then converted to heat. I don't have the references here, but I have heard that cell phones can cause local heating of tissue. A device held next to the brain that causes gentle heating should warrant some concern, whether or not it is ultimately shown to have adverse consequences. I'm not arguing that everything has the same level of danger, or that everything someone worries about truly is cause for concern. Total energy levels, distance from the source, length of exposure, type of radiation, , etc. all are important factors to level of risk. The concept of "Prudent Avoidance" makes a lot of sense. Where you are not getting a defined benefit, try to limit exposure to things with potential unknown impacts. In reading this comment I think you have ignored the effect of intensity. you are trying to equivocate "light" with "high intensity light" and then saying that if high intensity light is bad for things that are specifically prone to that same type of light, then all light may be dangerous for all biological things. Thats like saying breathing an atmosphere with 100% carbon monoxide in it is going to kill you, therefore we can't breath our own atmosphere that has a low, be significant CO2 content. It makes no sense, of course we can. We can, and do, shine low intensity light on us all day, every day with no health effect that are attributable to this light. 1 watt laser light does no more damage to any part of your body than light from a 1 watt LED (focused). However a 1kW laser certainly can heat up your skin, just like a 1kW heating element and burn you. The mechanisms are not different. No need to finish that sentence then. Anything that follows is surely inaccurate, misunderstood, or just plain wrong. Microwaves simply do not heat from the inside. That is magic you are thinking of. The energy impacts the water molecules on the outside of the food first and heats that first. It doesnt pass through the outside water first and start heating the center. Feel free to put a frozen chicken in a microwave for 1 minute and see if the center of the chicken is defrosted first. Or better yet, put an ice cube in the microwave. If you are right, you wont have a pool of water on the bottom of your microwave, you will have a cube with a liquid center. That should be enough to dispel any more magical thinking about how a microwave heats food. UV light is in the area of non-ionizing radiation to ionizing radiation. Its perfectly likely that some wavelengths in the UV spectrum are still ionizing. Of course being prudent is improtant. But being freaked out by DECT devices borders insanity for all the reasons I have pointed out above. LOL I just looked at your link. Did you? Microwave radiation (MW) is absorbed near the skin, while Radiofrequency (RF) radiation may be absorbed throughout the body. At high enough intensities both will damage tissue through heating." The skin and eyes absorb infrared radiation (IR) as heat. Workers normally notice excessive exposure through heat sensation and pain. Conflating that sort of exposure to a device that output less than a watt of EM emmissions is pretty laughable. Minor correction - Pu239 is also an alpha emitter, not a gamma emitter. Pu-238 is significantly more dangerous per unit of weight, as it has 1/300 the half-life (87 years vs 24,000)... but in any case it's always an alpha emitter. The information on sleep apnea cures should be known to everyone. The problem with Sleep apnea is that most of them are unaware of the condition. It can be only recognized by the close watch of the bed partner or the family member sleeping near you. So if you possess tired or sleepy and having snoring inform your partner or your family member to perform a close watch on your sleep and take proper treatment as prescribed by the doctor. Digital Enhanced Cordless Telecommunications (DECT) is a digital communication standard, Primarily used for creating cordless phone systems. I have heard that Cell phones can cause local heating of tissue. It is really very danger. Yeah, on the point on Digital using less power than analog and thus being safer is a good one to make. 2.45GHz microwave ovens are not "tuned" to water in any way. Please stop spreading this myth. The real reason for using 2.45GHz is that the FCC chose it as an unlicensed band. well I have read some research and studies that have shown that the use of cellphones foe a long period of time may lead to cancer and other health-associated problems so it is serious! Great Blog I am sure will be helpful for many and solving problem of snoring for others. Keep up a good work for Sleep Apnea Cures. Great post. I am pleased that you have shared your work with us. Every night I found myself have a difficulty to fall asleep, even if I have sleep apnea. So, I should feel very tired in the evening, which is true. However, when I'm in bed and turn off the light, a lot of things come to my mind and I cannot fall asleep. I found this particularly strange in a person who has a sleep disorder such as sleep apnea. Its looking nice about DECT. Thanks for taking the time to discuss this, I feel strongly about it and love learning more on this topic. If possible, as you gain expertise, would you mind updating your blog with more information? It is extremely helpful for me. shakeology Thanks again! One thing you must know is that when the cell battery reaches to the end level, it immitates more radiation. This is 200% radiation than in the normal usage. So one should be careful. What to do with money left to a child, when you are in financial ruin yourself? Yes, i agree with you. you have pretty serious matter regarding disease having by Phone. but i have heard and observed that dont keep your mobile phone on the front pocket of your shirt because it causes the Heart Attack. What Tech is Listening to. fMRI doesn't do what you think it does.